What a difference six months make. 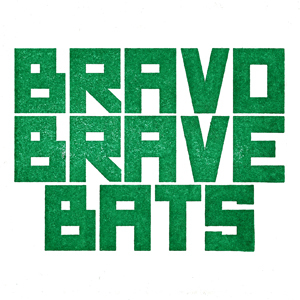 It was only in October 2010 that Bravo Brave Bats released their inaugural Red EP; full of that fire-in-the-belly, hurry-up-Harry-ness of a band wanting to get itself out there and be heard. But here we are with another, this time the Green EP, soon to be released. In the short time in between, BBB have been gigging a-plenty (24 dates in 10 months) and writing new material and the second fruit of their metaphorical loins will be presented to the world at Cafe Kino in Stokes Croft, Bristol on 26 March. The FB event page gives all the details – support from the excellent Tessellators and Model Boat – be there or be a regular quadrilateral. What the Bats are planning to do in having three EP’s out in relatively quick succession is to provide an unusual opportunity to see how a band grows and changes in the space of a few months. Red was pretty much a slice of how they sound in live setting, the drive and excitement of their live shows. Green properly had to do something more, to build on the experience of gigging and reflect the growing maturity and band development. This set does not disappoint: bookended by their more upbeat, poppy (not intended to be a slight that by the way) style the core of the EP is the three songs that are slightly darker, more adventurous, and for me a tantalising glimpse of where they might go next. First up is Pedalling, the sets obvious single if such a thing still exists and the subject of the first BBB video (see end of post). From the drum-led opening, swiftly augmented by the bass and then guitar riffs, this is redolent of nothing if not a 70’s inflected pop/punk song. The strong hook and with harmonies that are vaguely folky in origin; this is one of the more straightforward songs with obvious massive live potential and a great way to kick off this set. The gentle let-down at the end of A Hymn is brought to a halt by the start of Dry Drop which is once more song with greater power because of the increased control with which it is played. There is a rather subtle and delicate bass line riff (Dans’s playing through this song, and indeed elsewhere, is very good indeed. Perhaps we could have it a tad higher in the mix next time lads?). Once again Ieuan’s vocal is much more deftly delivered, with a build toward the last minute of rumbling bass and drum holding aloft the echoey, spangly guitar work of the final section – Hector’s guitar work is outstanding across the whole set and I am glad to see that the pedal tray is now really earning its keep! The track ends with a gentle slide back to a harmonised close. Anty Matter has been a live track for some time now and it’s a more obvious crowd pleaser with closer links to the Red period. The track has more chiming guitar and running bass lines which add a bit more texture and colour but its not such a rich sound and the harmonies not as tight as on some of the other tracks. Closer, Boys ♥ Me, is obviously designed to leave listener on a rollicking high with a great bass riff throughout. The bouncy drum attack, pop-tastic jangling guitar lines and shout-along chorus help make it a jolly, upbeat affair and is clearly a good fun live track. Altogether this a massive step up and a sparkling sextet of songs. The playing throughout is of the highest order and a remarkable sound-scape from a three piece and all without the use of over-dubs a-go-go. The tight underpinning drumming, more assured and controlled vocals, a fluent and musical bass and the newly enriched and augmented guitar sounds make for a more sophisticated and engaging set. But for me the triptych (can you have a triptych of songs?) Wagons, A Hymn and Dry Drop are where the greatest developments are to be found. The assuredness of writing and playing, the confidence revealed through the quieter passages, as well as the more intricate playing, all actually accentuate the quality of the band and their delivery. To be a great live band is a good thing as it stands, but to be a good live band supported by recorded material that stands up to repeated listens and offers more on each closer inspection is the sign of a band that is getting into its stride. If this is the sort of progress that has been made between the Red and Green EP’s in a matter of a few months, what might we expect from the third, Purple, EP that is due to conclude the planned series? This entry was posted in Uncategorized and tagged BravoBraveBats, HDU, Model Boat, Mono, Tessellators, video. Bookmark the permalink. Yeay the Bats… looking forward to going Green – nice work chaps!